While the crisp fall air and autumnal colors are still a few weeks away all I can think about is fall. I find myself searching pumpkin and apple recipes, Halloween costume ideas, and fall decorating ideas most nights. I love fall foods and candies but candy corn is probably my least favorite. 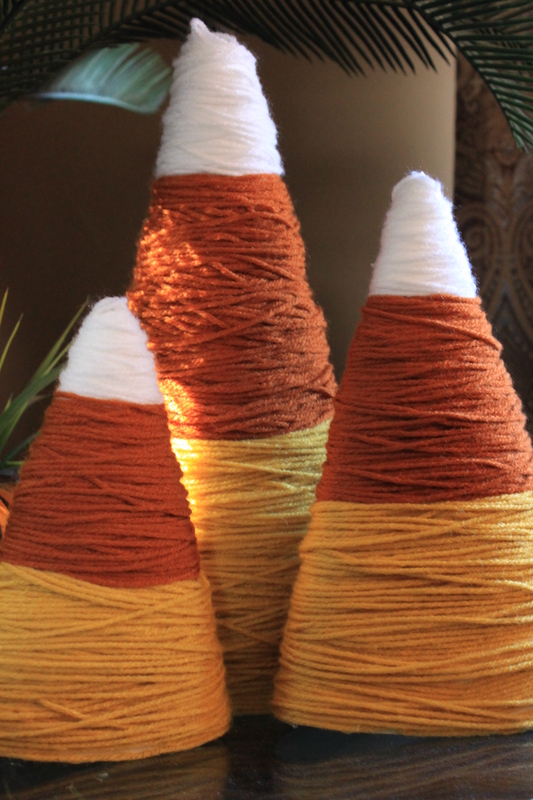 As soon as I saw the candy corn cones I instantly fell in love with them and several other projects that use them or was inspired by them. 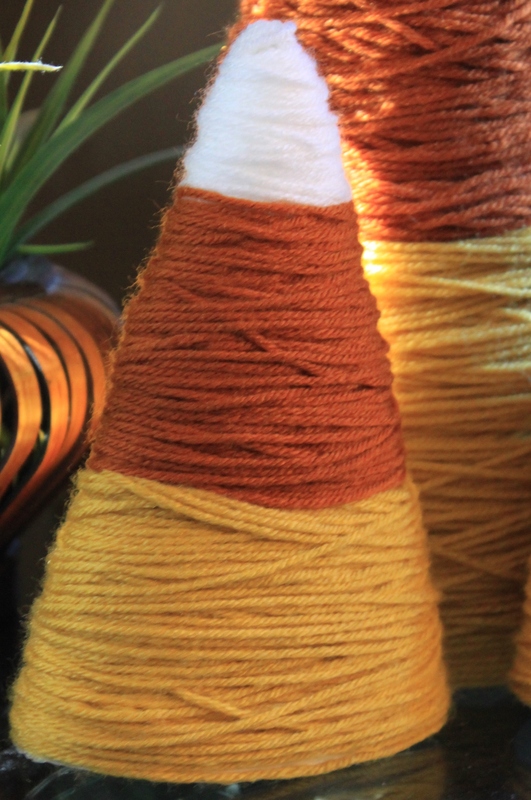 One of my favorite projects so far is from Thrify decor chick @ http://thriftydecorchick.blogspot.com/2011/09/candy-corn-love.html. Although I have only made one of the 3 projects today I might be making the others very soon. You should check hers out they do look a little different. The original was made with a foam cone. I know it would have been easier and stronger but I didn’t have any and I did have sheet after sheet of poster board so thought I would give it a shot. I figured that if it didn’t work I could just take the yarn off and try again. Well I was lucky it worked great! 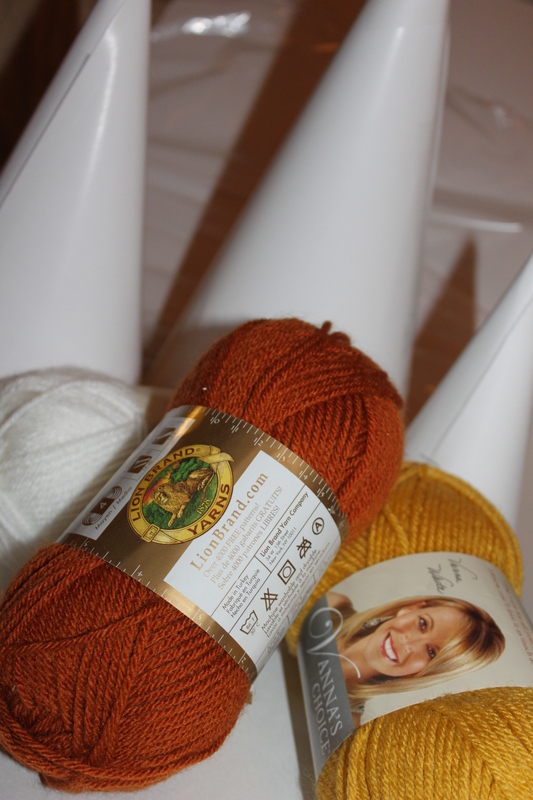 yellow, orange, and white yarn. I used Poster board so stapes scissors and tape were also needed. I rolled them into a cone. Just eyeballed it. placed a staple or two in the bottom. added a few more stables and taped the seam. I also added some hot glue around the first row to make them stay in place. Tape the end of the first color of yarn on the bottom and start wrapping. This is where the foam would have been a bit easier. 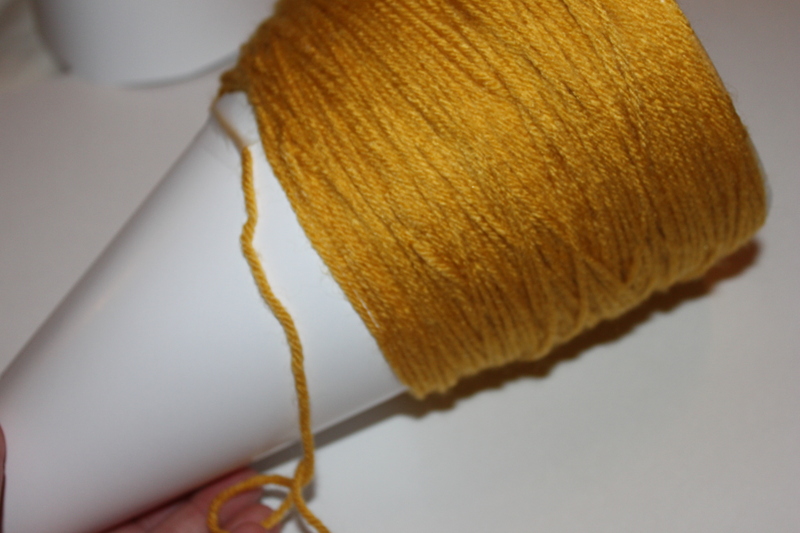 The PB was slippery so I had to tape the yarn in a few spots the first time around so that it would not slide. So with cone 2 and 3 I added hot glue spots here and there so i didn’t have the same problem. Tie off at the end of yellow and start orange the same way. Then white. The top is the hard part. I suggest placing a felt circle or taping or hot gluing a few crossing yarn layers on the top before starting with the white. So when I had them done there was something just not right about them. They were fine but were cones so I gave them a squeeze. That is all they needed! That and because I used the hot glue I was fine and the yarn didn’t move. But if I were to do it again I would pinch it together before wrapping them. Now the shape is much more like candy corn and I am very happy with them. Posted in Crafts, Holidays, Recreations of Pinterest Pins. Bookmark the permalink. So this was my little fall project last year. I am planning on spending sometime on pinterest tomorrow to look for something exciting to make for fall. Now that the kids are back to school I feel like getting crafty again. I love your great idea! I’ve included it on my blog “links I love” post for today!